images courtesy of Audities Foundation Calgary AB, Canada. 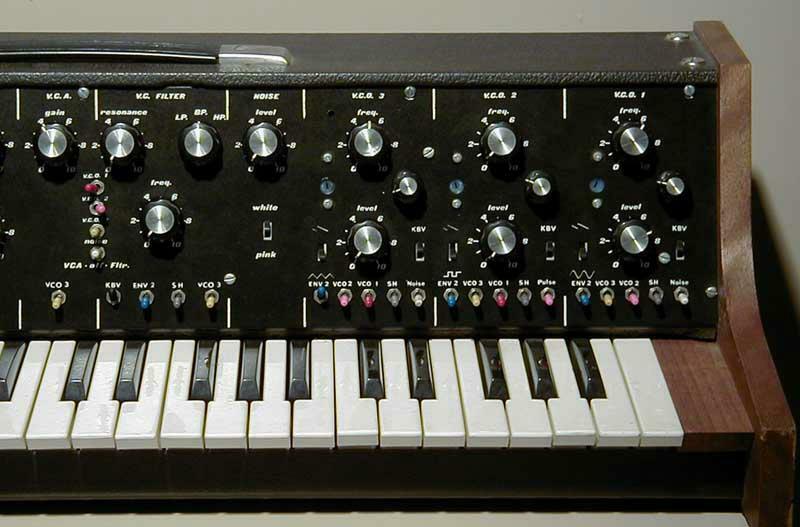 The Synthacon is a 3 VCO monosynth with a 4 octave 49-note (C-C) keyboard, 26 knobs, 3 trimmers and 43 switches (including 28 color-coded toggle switches). It has thick wooden end pieces and a steep sloped silver (on earlier models) or black control panel above and quite close to the keys. The Synthacon is said to be quite rare. It is unclear exactly how many were made and sold. The Synthacon also came in a duophonic version, sold as the "Two Voice Synthacon." Synthacon product literature also describes an "Optional Carrying case... Available on special order". From the pictures it looks like a "Calzone-type" road case. The Synthacon's architecture is divided into ten sections: Keyboard, Sample and Hold, Trigger Generator, Dual Envelope Generator, VCA, Three Mode Filter, Noise Generator, VCO1, VCO2, VCO3. Interestingly these sections are layed out with the signal path starting with the oscillators on the right and going left, reverse of the typical keyboard layout of most of the monophonic analog keyboards of the day. The Keyboard section has controls for Tune, Scale, Portamento (Glissando), Range Select (enables the keyboard to play over an 8 octave range), and pitch bend (a knob, not a wheel). The Sample and Hold section has controls for output level and trigger source, selecting between the keyboard or the trigger generator. The Trigger Generator has a knob for rate and switches for Manual Gate, Keyboard Gate, and Free Run. In the Dual Envelope Generator section, each envelope features knobs for Attack Time, Duration Level, and Decay Time, plus switches to select trigger sources (Keyboard or Trigger Generator) and Damp Select (ON/OFF). Env1 is hardwired to control the VCA only. Env2 can be routed to a number of different destinations using the toggle switches below the various sections. Attack sets the time required for the envelope to build to it's full level. Duration level sets the level at which the envelope sustains (whenever the input trigger is longer than the attack time). This knob has no effect if the input trigger duration is less than the attack time. When the trigger is shorter than the attack time, the emvelope goes directly into decay when the attack is finished if the damp switch is OFF. If the damp switch is ON, the envelope goes to 0 very quickly at the end of the trigger time, even if the attack is not finished. Decay sets the amount of time required for the envelope to decay once the attack is finished. If the input trigger is shorter than the attack time, decay is the time to go to 0. If the input trigger is longer than the attack time, then the decay knob sets the time to decay to the duration level and then after the trigger is released, the time to go to 0. There is also a common switch for the generation of complex envelopes using both envelopes. When the Common switch is ON, envelope 2 is combined with envelope 1 and both go to the VCA. Env 2 is still available at the toggle switches for other modulation duty. The Voltage Controlled Amplifier(VCA) features a knob for gain and switches allowing input of VCO1, VCO2, VCO3, Noise, and Filter. There is also an on/off switch which allows VCO3 to modulate the overall gain. The Voltage Controlled Filter(VCF) is a multimode filter with a know which switches between Low-Pass, Band-Pass and High-Pass. It features inputs for VCO1, VCO2, VCO3 and Noise. There are knobs for frequency and Resonance(Q). Four toggle switches allow the VCF to be controlled by Keyboard, Envelope 2, Sample and Hold, and VCO3. The filter can also be bypassed alltogether. The Noise Generator features a switch for white or pink noise and a knob for level. Product literature discribes a "minimum of 17 1/2 octaves", all oscillators (including VCO3) having a wide dynamic range of less than 0.1Hz to greater than 20kHz. All VCOs have knobs for Frequency and Level. VCO1 and VCO2 have an additional fine tune knob. VCO2 can output sawtooth, square, or pulse waveforms and can be modulated by any, all, or none of the following: Keyboard, Envelope 2, VCO3, VCO1, Sample and Hold. VCO3 can output sawtooth, square, or pulse waveforms and can be modulated by any, all, or none of the following: Keyboard, Envelope 2, VCO1, VCO2, Sample and Hold, Noise. VCO 2: Controls - Frequency (course and fine), Level, KBD Track, Output Select (sawtooth/square/pulse), Modulation by any, all, or non of the following: KBD, Env 2, VCO 3, VCO 1, Sample & Hold. VCO 3: Controls - Frequency, Level, KBD Track, Output select (sawtooth/triangle), Modulation by any, all, or none of the following: KBD, Envelope No. 2, VCO 1, VCO 2, Sample & Hold, Noise. 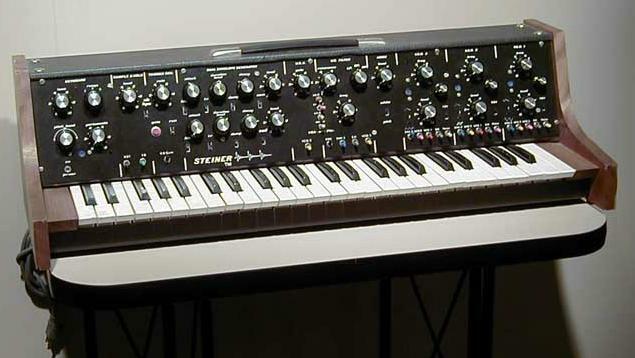 The Synthacon has a total of four external inputs: through the Sample and Hold, through the Keyboard, in parallel with the Trigger Generator, and as control voltage to the Filter. Back panel outputs include "DC Ground and all operating voltages, plus keyboard control voltages. These outputs can be used to run optional modules with the SYNTHACON, (such as sequencers, etc.) which are manufactured by STEINER-PARKER as well as many optional units manufactured by other companies (using special adapter cables). Back panel connectors are also provided to allow connection to an external sound source for amplifying the SYNTHACON'S output as well as connections for all the external inputs listed above". Power requirements: "117 Volts at approximately 15 Watts". -- From steiner 1975 product literature.